This all-Australian self-guided DVD-based training course from Matthias Media teaches participants how to answer 17 common questions about Christianity. The DVD covers each question in a 20 minute presentation (total 5 hours, 40 minutes of teaching), and is to be used in conjunction with the separately sold Workbook for participants. Features contributions from such leading Australian Christians as John Chapman, Kel Richards, Peter Bolt, and Kirsten Birkett. 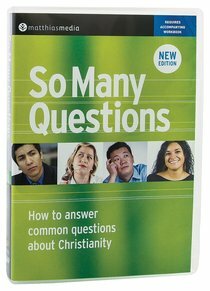 About "So Many Questions DVD"
Customer Reviews For "So Many Questions DVD"
This DVD answers 13 questions that Christians are commonly asked by unbelievers. Questions include 'How do I know God exists in the first place?' and 'Why is the Bible anti-gay?'. Each answer goes for about 5 minutes and is given by one of five evangelical Christians including Al Stewart and Claire Smith. The answers given are comprehensive, clear and succinct and give great food for thought and discussion. This resource would be great for a Bible Study group to use. You could watch one each week and then move on to your Bible Study, or use the related study guide to sharpen each other in your interactions with unbelievers.